Florida organizations which qualify for an exemption from sales and use tax on purchases of tangible personal property and services must file a form DR-5 with the state Department of Revenue to receive this status. This document is available on their website. 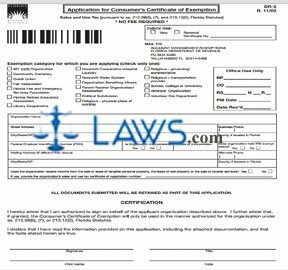 Florida Application For Consumer's Certificate Of Exemption DR-5 Step 1: At the top of the form, indicate with a form whether you are filing a new application or are filing for a renewal of an already granted exemption. If the latter, give your certificate number. Once approved, a certificate of exemption must be extended every five years to remain in effect. Florida Application For Consumer's Certificate Of Exemption DR-5 Step 2: The next section lists eighteen different organizations which are eligible for this exemption. Check the box next to the statement which best describes your organization. Florida Application For Consumer's Certificate Of Exemption DR-5 Step 3: Enter the name of your organization on the first line of the table below. Florida Application For Consumer's Certificate Of Exemption DR-5 Step 4: On the second line, enter your street address and business telephone number. Florida Application For Consumer's Certificate Of Exemption DR-5 Step 5: On the third line, enter your city, state and zip code. If you are located in Florida, you must give the name of your county. Florida Application For Consumer's Certificate Of Exemption DR-5 Step 6: On the fourth line, provide your Federal Employer Identification Number. Indicate with a check mark if your organization is incorporated. If so, give the date of its incorporation. Indicate with a check mark whether or not your organization has been deemed exempt by the IRS. Florida Application For Consumer's Certificate Of Exemption DR-5 Step 7: On the fifth and sixth lines, enter your mailing address if it is different from the one provided above. Florida Application For Consumer's Certificate Of Exemption DR-5 Step 8: On the seventh line, indicate with a check mark whether your organization receives income from the sale or lease of tangible personal property, from the lease of real property or from the sale of taxable services. If so, give your sales and use tax registration number. Florida Application For Consumer's Certificate Of Exemption DR-5 Step 9: Sign and print your name. Provide your title and the date.